Ventricular septal defect (VSD) review for nursing students! In this review you will learn about the congenital heart defect known as ventricular septal defect (VSD). This is a topic you will see on your pediatric nursing lecture exams and possibly the NCLEX exam. After reviewing these notes, don’t forget to take the quiz that contains ventricular septal defect NCLEX questions and to watch the lecture. 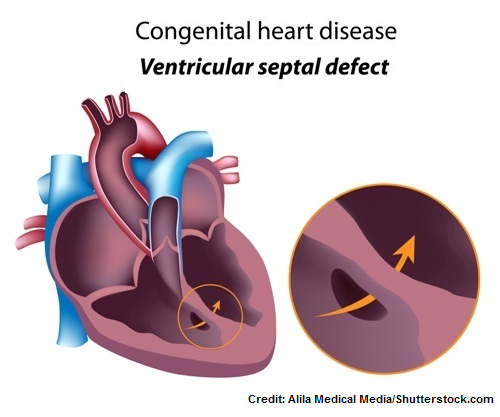 What is a ventricular septal defect (VSD)? 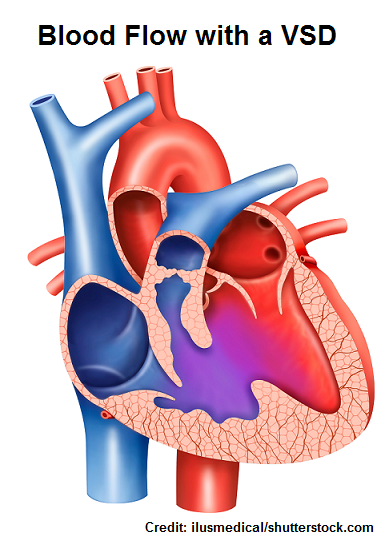 It’s a congenital heart defect that occurs when there is a “hole” in the ventricular septum. This causes an increase in blood flow to the lungs. 1 in every 240 babies born in the United States each year are born with a ventricular septal defect. There are various types and sizes (small, moderate, large) of VSDs that affect specific layers and areas of the ventricular septum (some patients can have multiple VSDs). Muscular: found at the lower part of the septum in the muscle layer. Small muscular VSDs have a high chance of closing on their own. Small VSDs are monitored and many times close on their own. Many large VSDs require medication treatment and surgical repair, especially if causing complications. Large VSDs are really the ones that cause problems. Therefore, the patho in this review will really be concentrating on a large ventricular septal defect. As noted above, small ones may close on their own or generally don’t affect pulmonary blood flow. What is happening with the blood flow due to a large ventricular septal defect? Goal of this side is to get the richly, oxygenated blood to the body to feed the brain, tissue, muscles, organs etc. Blood will enter the heart the same way as stated above, but there is a problem. There is a HOLE in between the ventricles. As blood flows through the heart, this hole in between the ventricles will create a LEFT to RIGHT shunt of blood. In other words, blood in the left ventricle will flow into the right ventricle (remember this blood has already be on the right side). WHY is there a left to right shunt? The pressure in the left side of the heart is higher than the right, so blood will easily flow back into the right ventricle from the left. This causes MAJOR problems overtime! The right ventricle will be receiving EXTRA blood from both the inferior/superior vena cava and now the left ventricle, and all this blood will be going to the lungs. This is going to cause a couple of issues. First, the right ventricle will have to work harder to pump all that extra blood (hence it will enlarge and overwork the heart). Second, all the extra blood flow to the lungs stresses out the arteries of the lungs. The arteries will become damaged and NARROW. This leads to pulmonary hypertension. Due to this increased pulmonary vascular resistance, the heart will have to pump EVEN HARDER to get the blood to the lungs. This creates a very bad situation for the infant. The infant’s heart will have to pump harder. This will burn more calories and eventually tire out the heart and lead to heart failure along with respiratory issues (at risk for frequent lungs infections due to congestion of fluid), issues with growth (tires easily and can’t feeding properly), and risk for valve issues and endocarditis. What if this is not treated? 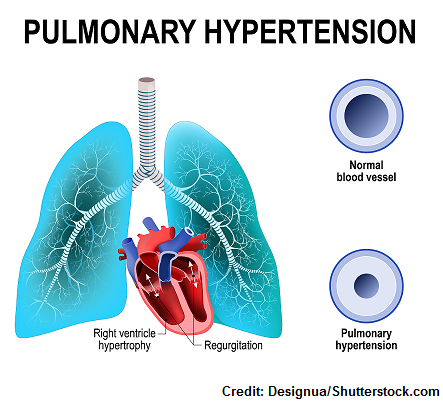 A reversal of blood shunting from right to left will occur due to the extensive pulmonary hypertension in a condition called Eisenmenger syndrome. With this new change in blood shunting, unoxygenated blood (remember it’s leaving the right side and hasn’t went to the lungs yet) will start to enter circulation because it crosses over through the hold into the left side and goes into the systemic circulation rather than to the lungs. Due to this, cyanosis and clubbing can start to be seen. When are signs and symptoms noticed with a VSD? The signs and symptoms and complications of VSD don’t develop immediately after birth because pressure changes within the lungs and the right/left side of the heart will occur gradually as the baby adjusts to life outside the womb. So, before a baby is born the pressure in the right and left side of the heart is the same, but after birth when the baby starts using its lungs the pressure on the right side starts to slowly change. The pressure in the right side will start to decrease compared to the left side. This will usually be completed around 2-3 weeks after birth. With that in mind, if an infant has a large opening in between the ventricles (hence a VSD) at birth, usually no signs and symptoms may be present (possibly a heart murmur) until later because the pressure in the right side is just now adjusting. However, after about 1-3 months of life the baby will start showing signs and symptoms related to the VSD, such as heart failure, pulmonary hypertension, and growth/ feeding issues. This is occurring where you have the gradient of blood flow from the left ventricle to the right ventricle during systole. A small VSD can actually produce a louder, harsher murmur than a larger one. Think about the sound it makes when you blow air through a small hole vs. a large hole…the concept is the same here.